(Bloomberg) -- The Bank of Japan should stop buying exchange-traded funds as the purchases will ruin the stock market’s ability to allocate capital efficiently, according to the chairman of Commons Asset Management Inc.
Ken Shibusawa, who has more than three decades of investment experience at firms including Goldman Sachs Group Inc. and JPMorgan Chase & Co., said the BOJ’s trillions of yen in ETF purchases since 2010 will make Japan’s stock market as dysfunctional as the bond market. He is a descendant of Eiichi Shibusawa, the 19th century industrialist who led Japan’s introduction to capitalism after the Meiji Restoration. With the BOJ’s ETF holdings totaling 29 trillion yen ($259 billion) as of September at market value, the central bank owns 77 percent of the nation’s ETF market. If the central bank keeps purchasing, it will likely overtake the Government Pension Investment Fund as the largest holder of Japanese stocks in the next several years, Shibusawa said. That has raised concerns about the sustainability of the BOJ’s program as it struggles to achieve a 2 percent inflation target after six years of stimulus. Governor Haruhiko Kuroda said in February that the BOJ would have unrealized losses on its ETF holdings if stocks fell below 1,350 on the Topix. His comments came after JPMorgan Chase warned that a drop in the gauge to between 1,400 to 1,200 could force the BOJ to rethink ETF purchases because of the risks to its financial health. While the Topix’s Monday close of 1,627.93 is well above those levels, the benchmark was as low as 1,409 in December as concerns over a slowdown in global growth caused an equity meltdown worldwide. 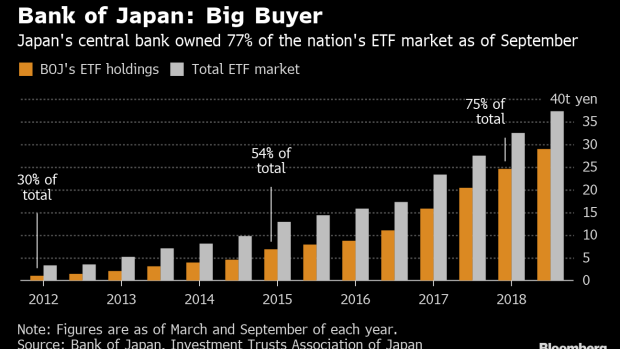 The BOJ bought a record 6.5 trillion yen in ETF purchases last year, exceeding its 6 trillion yen target. The central bank needs a vision for eventually unwinding its massive asset purchases if it eases policy further, according to Takashi Kozu, who held a wide range of positions at the central bank and was a member of the Basel Committee on Banking Supervision from 2006 to 2010. One option to extricate the BOJ from its ETF buying program would be for the central bank to sell the assets to individual investors with inheritance tax exemptions, Commons Asset’s Shibusawa said. Households held 1.83 quadrillion yen of financial assets, including 984 trillion yen of cash and deposits as of the end of December, according to BOJ data. Shibusawa said his great-great grandfather would have been “furious” if he were alive to witness the BOJ’s policy. An image of the so-called Adam Smith of Japan will be featured as the face of the new 10,000 yen bill that Japan plans to circulate in the first half of the fiscal year starting April 2024, Finance Minister Taro Aso said last week. When asked what Eiichi may have thought about modern Japan, Shibusawa said that the industrialist would have complained that too many companies have been offering life-long employment and using a seniority systems at a time when employees should be required to show self-growth.